Ecological farming and gardening - will it work for me? Ecological farming and gardening – will it work for me? It’s an easy mistake – thinking that size matters. That ecological techniques for growing food are only suitable for hobby farmers and home gardeners. That they won’t work in my climate. Property size doesn’t matter. Neither does climate. We can reduce our costs and boost production by bringing back Nature’s FREE ecological services on any size of land from the Equator to the permafrost! The principles are the same. Here’s two examples – a large commercial farm in cold North Dakota and a back yard in tropical Queensland. Whether you’re growing for family, your local farmer’s market, or selling big time to wholesalers and supermarkets you’ll learn heaps from their stories. Gabe Brown and his family farm over two thousand acres in the grain belt in North Dakota, USA. Twenty years ago, they had a complete re-think about their farming practices. Gabe decided that the solution for their degraded soil was to use farming techniques enabling them to mimic native ecosystems in their region – the Prairies. “It’s made least cost producers out of us… we’re saving a tremendous amount on inputs”. With corn, for example, the family are producing “25% higher than the county average without all the costs involved”. Watch this short video showing how the Brown’s have used ecological practices to improve their profitability. Conventional production techniques for broadacre cropping is hard on soil. If the Brown family can improve their soil we can too in our orchards, market gardens and backyards! 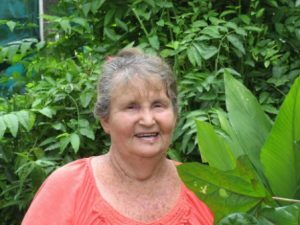 Carol Laing’s garden is in the suburbs of Cairns in tropical north Queensland. Carol’s recent soil test shows that her soil is now a loam soil with a pH 6.9, and organic matter 6.8%. By comparison, most farmers aspire to have 4% organic matter! Walking around her garden you can see the difference. Her plants are healthy and growing vigorously. At Hill Top Farm in far north Queensland, Australia, we look to the nearby native forests for guidance. Want to use this ecological approach? Bringing back Nature’s FREE ecological functions to your farm or garden is your roadmap to solving problems rather than just treating the symptoms, and constantly spending money on inputs. Start small, test tools, techniques and species to see what works best for your growing conditions. Take advantage of our publications and workshops. (1) Wendy Seabrook, 219, Ecological Farming Handbook. Lead illustration © Laura Quincy Jones lauraquincyjones.com. All other pics from the Brown Family.